Tuesday four BUA students — Nicolás Lopez, Jorge A. Calvo, Luis D. Rios and Fabian Espinosa — received the Jesús Alvarado Bi-vocational Pastors Scholarship for bi-vocational pastors. More than 200 churches in Texas need a pastor, according to the Texas Baptists Office of Hispanic Ministries. The U.S. Census Bureau reports that Texas had the largest increase of Hispanics from 2016-2017, and the Office of the State Demographer projects that Hispanics will outnumber Anglos in Texas by 2020. These trends underscore the rising demand for ministers who are willing to serve bi-vocationally and are also equipped to engage a cross-cultural congregation and community. The Alvarado family is well aware of bi-vocational ministry challenges. Two weeks ago they closed the doors of Alpha and Omega Baptist Church in Cicero, Illinois, after seeking a pastor for five years. The family patriarch, Jesús Alvarado, planted the small, bilingual church and served as the bi-vocational pastor until his death in 2013. In memory of their dad, who was called to ministry in his 60s and faithfully served until he passed away at age 97, Dr. Marta Alvarado, Manuel Alvarado, Anita Alvarado Ward, David Alvarado and Irene Alvarado Elizondo, started the Jesús Alvarado Bi-vocational Pastors Scholarship fund. The family has a heart for bi-vocational ministers and sees a need to invest in cross-cultural leaders. 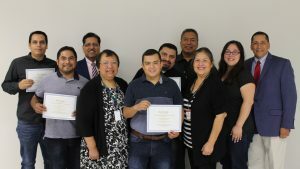 Tuesday they awarded four scholarships to Baptist University of the Américas students — Nicolás Lopez, Luis D. Rios, Fabian Espinosa and Jorge “Amin” Calvo — who are also serving as bi-vocational ministers in area churches — Woodland Baptist Church, Southside Baptist Church, Crossroads Baptist Church and Belen Baptist Church, respectively. The Alvarados have ties to Texas, the University and Baptist life. San Antonio was Pastor Alvarado’s hometown. The family was also connected closely with the school when it was operating as the Mexican Baptist Bible Institute. In the 1980s their church in Chicago benefited from visiting ministers who came from BUA to lead revivals. Amin, one of the scholarship recipients, understands this challenge well. He is a volunteer preaching pastor at Belen Baptist Church in Dilley, a two-hour round trip from campus. Many churches cannot pay pastors’ salaries. Like many students at BUA, Amin, a native of Mexico City, is already a recognized cross-cultural leader. Not only does he preach in both English and Spanish, but he has also planted two churches in the Amazon with a summer missions team he joins in Colombia each year. If you are interested in investing in the mission and work of BUA, give here.